Its a boy, no wait, its a girl, no, its a diesel box truck with a lift gate! We have concluded our Truck Fund Raising Campaign that has been going since November of 2012. 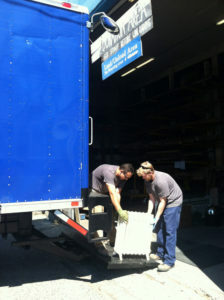 The new box truck with a lift gate is now serving us well in the Seattle operations. Of course, it is a used vehicle. It even came in a shade of blue. The new truck’s name is still pending but we welcome this beast of burden to the RE family. This is huge – giving us a more reliable truck fleet to better serve you and communities throughout Washington State. Our salvage crews come to your job site, home, business, storage space or your grandpa’s crazy old barn to pick up and salvage materials. These busy bees visit over 1200 job sites each year. If the trucks break down, the crews end up wasting time and money, losing efficiency and materials. That takes away from the 5 million pounds of material that The RE Store diverts every year from being wasted. Those materials also save you money when you go to buy supplies for your remodel, decoration or art project. We have been helping transform the building industry’s practices that generate one-quarter of all trash in the U.S.. Our crews are the back up that contractors need to reduce disposal fees on job sites, saving supplies to be reused. This is how we have created our jobs at The RE Store from what would have been garbage. This is how we are moving the reuse revolution forward. And we thank you for your help.